So, your quest for the best garden sprayers brought you here, right? Great! We are here to help you get the value for your money so let’s start with the basics right away! You see, a lot of factors come into play before you can settle for a particular sprayer amongst the many models available on the market. Chief among them is the unit’s ability to handle your needs and the ease of use. In simpler terms, you have to check the sprayer’s tank capacity, the design and the weight. Did you know, for instance, that some garden sprayers come with optional battery power? Of course, the unit has to be durable, so you have to be on the lookout for the materials used to construct parts such as the gasket, tank and the pumping handle. Even then, scrutinizing every other sprayer on the market is no easy task. But you don’t have to sweat over it, not with us around. We’ve done a rundown of the most-sought-after models based on the factors stated above. And now, without further ado, here are the best garden sprayers on the market. Any of these choices promise to help keep your yard succulent every season. If you have arthritis or wrist problems, you need to check out this sprayer. 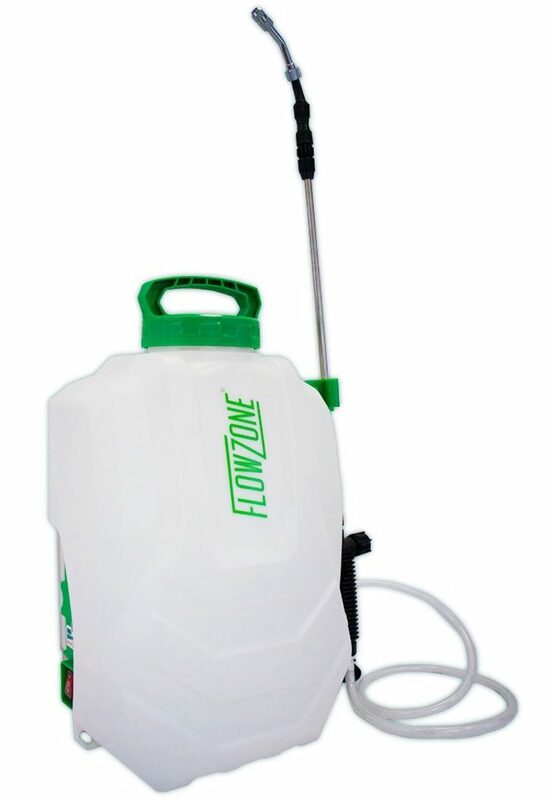 Made by Flowzone, an industry leader, it features a four-gallon tank and dual nozzle attachments so that you can shift between spray patterns quickly. And, that’s not even the best part! This unit comes with an integrated 2.6Ah lithium-ion battery, enabling you to spray up to 40 gallons of chemicals without using your hands! A single charge lasts for up to two hours, and you even get to choose between two spraying pressure settings (45 or 60 psi) with a spray distance of up to twenty-five feet. 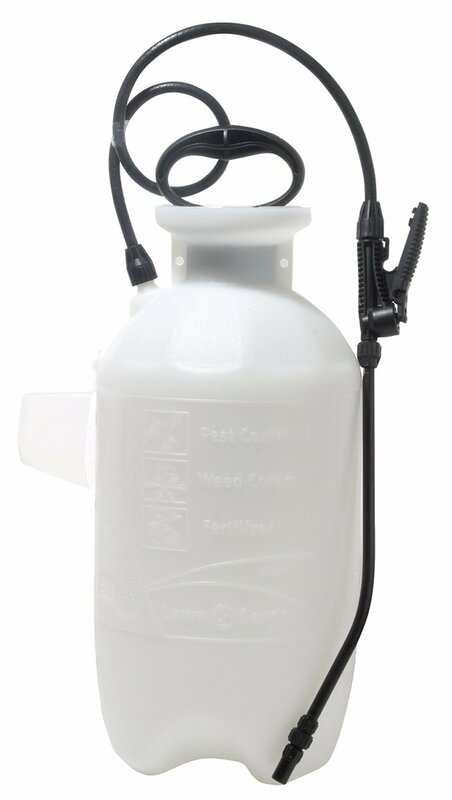 The FlowZone sprayer’s tank is not only semi-transparent but also has volume indicators. That way, you don’t have to guess about the amount of herbicide in the tank for a particular task. Plus, you can extend the wand up to 36 inches and lock the triggers for continuous spraying. 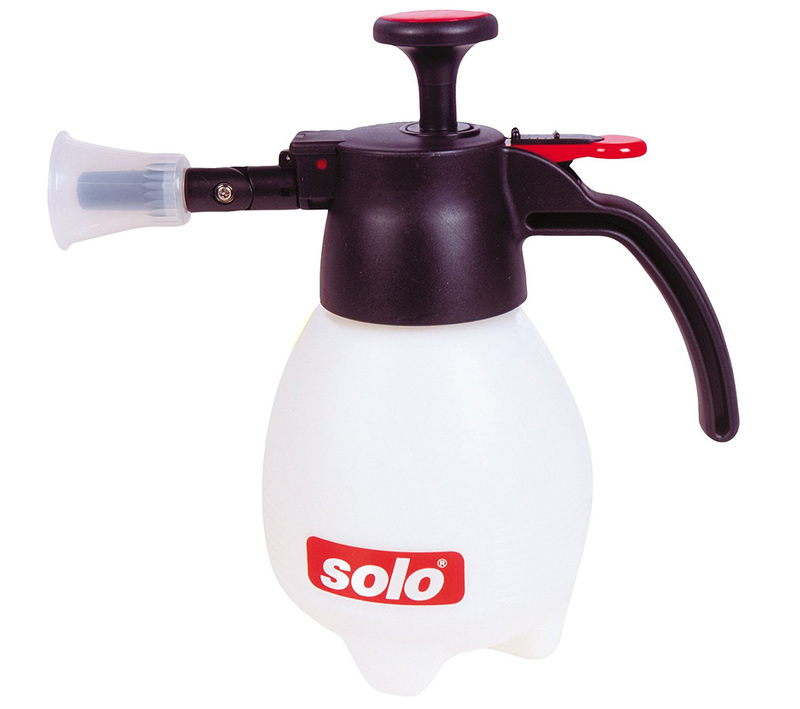 Another battery-powered option, the Solo 416 seeks to revolutionize how you spray. It is an excellent alternative if you’re looking for a more robust alternative than the FlowZone. Remember when we said that quality is a key consideration when purchasing a garden sprayer? Well, this model’s level of quality doesn’t disappoint. First off, it features a tubular aluminum frame for years upon years of use. The tank is HDPE-UV resistant while the inlet strainer sports long-lasting stainless steel mesh. The Solo 416 can handle virtually every other spraying task whether you’re talking about greenhouses or general indoor spraying. It is quiet with faint vibrations and almost non-existent emissions. The wide, adequately padded straps allow you to carry the sprayer for long without operational fatigue while the drain hose and valve prevent dripping. If you have a small yard, or a looking for a portable sprayer to take care of your flower beds and indoor plants, look no further than the Solo 418. It has a capacity of one liter, is incredibility lightweight, and you can use it with one hand. We take a closer look at this cheap garden sprayer and what makes it unique. The Solo 418 may have a diminutive size, but it can hold up well against the harshest of chemicals. It boasts a Viton gasket and O-rings so that you can use it with a range of herbicides and pesticides depending on the task at hand. 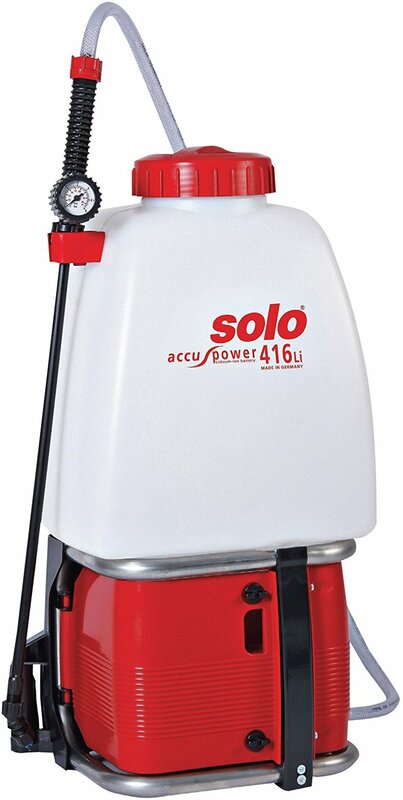 A pressure sprayer as compact such as this one needs to be comfortable to use. Indeed, it is. All you have to do to keep it spraying is to lock the trigger. In the meantime, be sure to leverage the ability of the dual directional spray nozzle to get the most out of your unit. And, the leak/drift guard will give you, even more, control of the speed at which the chemical spews out. Nonetheless, you have to clean your sprayer to keep its functionality intact. The 190447 is one of best garden sprayers if you’re searching for a professional grade model with a stable performance. Its manufacturer says that it’s meant to “work hard as you do” and we couldn’t agree more. Here’s what you get for your money. While this sprayer may not have the same convenience as its battery-powered counterparts, it has an excellent pump mechanism to make up it for it. In fact, it takes 25% fewer pumps to achieve the same output as you would with other models in its category. Besides, you can shift from high and low volume fans for increased adaptability. In the meantime, the pressure relief valve eliminates the likelihood of accidental chemical spray whenever you open the tank. 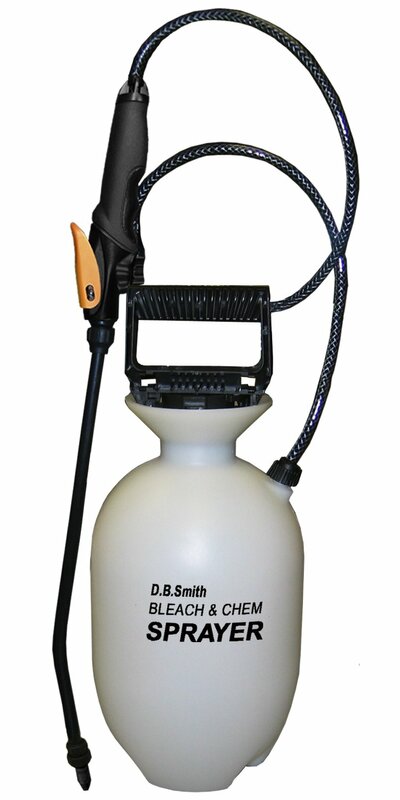 This pressure sprayer’s tank has a unique tear-drop shape to increase stability at the base when in use. That way, you don’t have to worry about tipping or unnecessary chemical spills. Moreover, the integrated protective slot offers safe storage for the nozzle. Other highlights worth mentioning include a stainless steel 21-inch wand and easy to clean (and repair) pump seals. 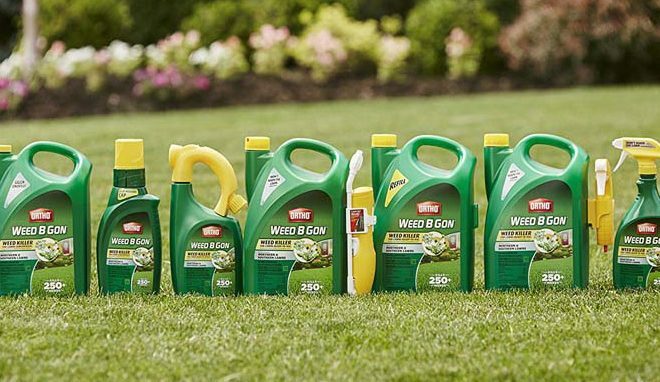 Featuring a four-gallon tank, the 61800 ProSeries offers everything you need to keep a small to medium sized lawn free of weed or pests. 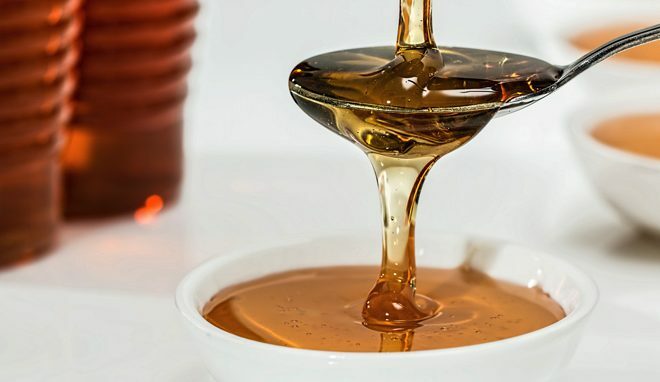 It sports a four-inch wide mouth opening for quicker refills and cleaning not to mention that it can accommodate three different nozzles to handle a multiplicity of applications. What’s more? As a gardener, the last thing that you want is a sprayer that doesn’t allow you to use as many different chemicals as possible. The 61800 ProSeries, however, is handy as they come – it is compatible with conventional pesticides, herbicides, and fertilizers. In fact, you can use it with different solutions in a day as long as you clean the tank thoroughly each time you change the chemicals. One of the most common gripes with garden sprayers is the blocking of wands and nozzles, but that shouldn’t be a cause of concern with this model. 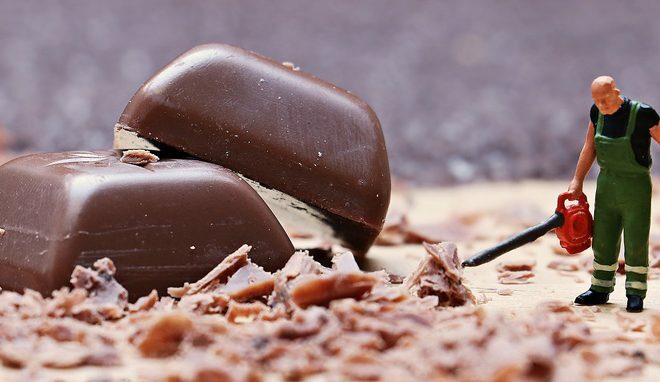 It features a three stage filtration system to reduce the risk of clogging to its bare minimum. 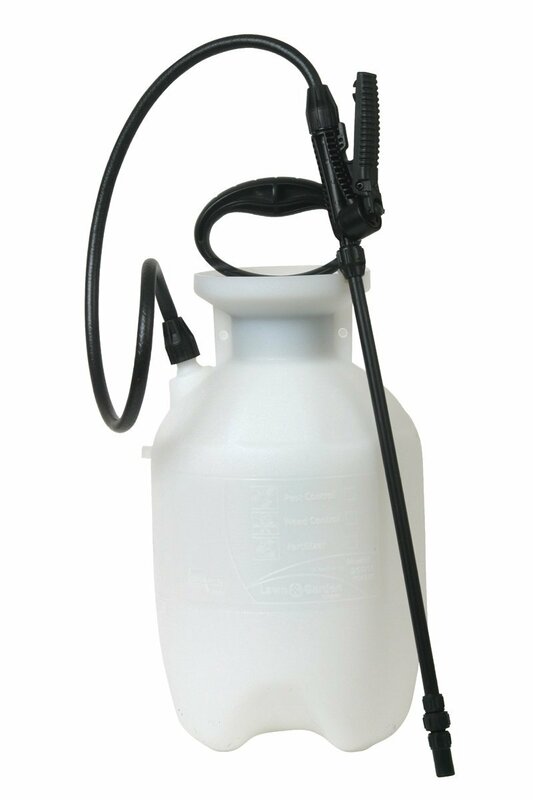 The SureSpray comes with a two-gallon tank making it a brilliant option if the ProSeries is too large for your needs. And just like any other model by Chapin, its quality and performance are not in question as we outline below. The SureSpray is compact, lightweight and easy to carry around. It is perfect for any homeowner who does a lot of spraying now and then. The handle is ergonomic for quick pumping plus you don’t have to use a lot of effort to get the job done. One of its users says that it only takes a one or two pumps for a gallon of liquid. How you clean your sprayer determines how well it will hold up against frequent use. Filling it up is essential too, as it prevents unnecessary waste of chemical solutions. With its large top opening, the SureSpray further assures you that maintaining it is easy and that you’ll always enjoy no-mess filling. With all that it has to offer, this could very well be the best garden sprayer for commercial use for anyone who doesn’t want to deal with the rigors of hand spraying. Yes! You can use the Smith Contractor 190217 with a many as five different nozzles. Now that’s what we call taking versatility to a whole new level. The nozzles include poly, brass, foaming and two flat nozzles. The 21-inch wand adds improved usability to a refined gardening tool. Did you know that over compression can damage your garden sprayer’s nozzle? It is for this reason that the makers of Smith Contractor 190217 ensured that it adjusts the pressure to 60 psi automatically to guarantee a smooth flow of chemicals. Nonetheless, you can easily control the spray pattern or change the pump seal to prevent leaks under pressure. The name says it all; doesn’t it all? 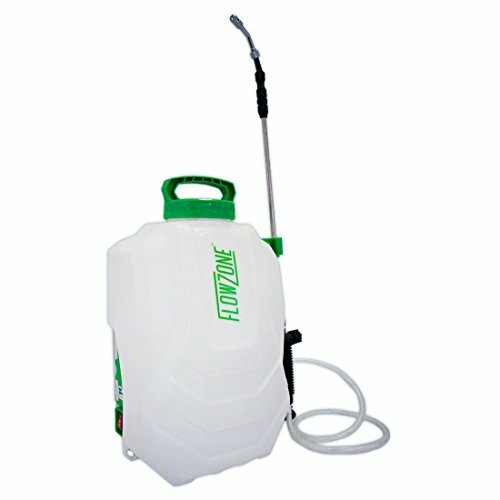 This sprayer can handle both commercial and home tasks. It is for any eager beaver who doesn’t mind putting a little more effort to get the work done. 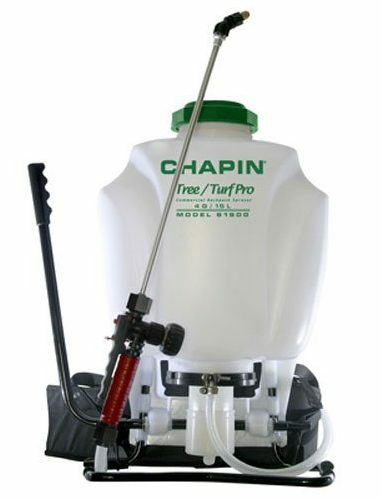 This unit can operate with fungicides and pesticides as well as fertilizers making the ultimate pressure sprayer. 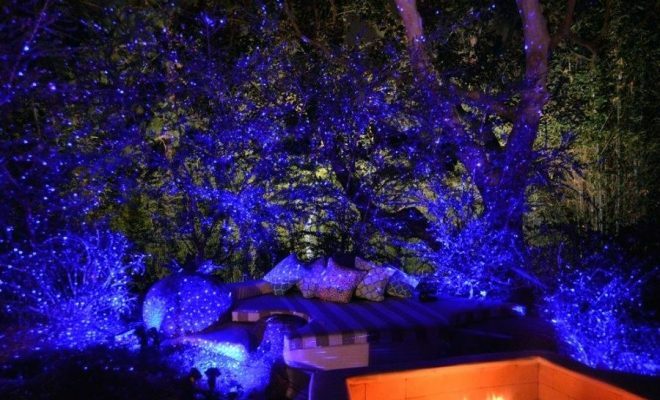 Here’s why it a serious contender for the best garden sprayer spot on this list. The Chapin 61900’s reliable performance is what sets it apart from its competitors. While it comes with a four-gallon tank, it has a powerful spraying action to allow you to cover a large yard/garden it in a few minutes. Other than that, you can always check the pressure with every pump via that a tactically located gauge. 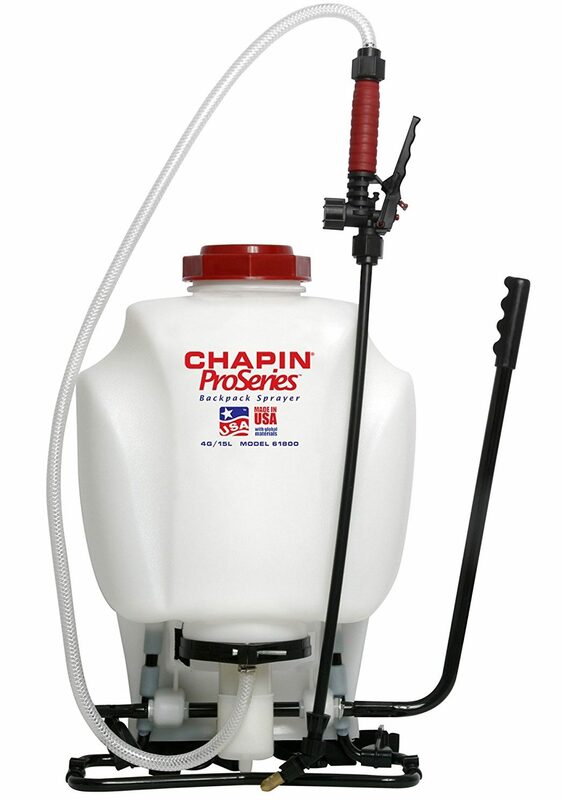 From the tank to the wand, the Chapin 61900 has adequate sealing in every part that’s susceptible to leaks. Even then, it is important to note that you shouldn’t use it for strenuous tasks to continue enjoying the leak-proof construction. Of course, the cushioned shoulder straps bring forth the comfort you need to carry your sprayer for hours. Never mind that this sprayer is nowhere close to being a high-end model, its design is impressive nonetheless. The nozzles, for instance, are not corrosive and so is the spraying wand. The housing is chemical resistant and the pressure pump, highly efficient. With such an impeccable design, it is pretty easy to understand the drive behind all the praises that the Smith 190285 has attracted from satisfied users. 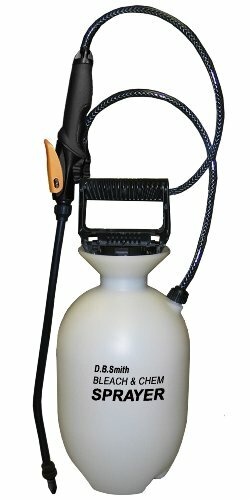 You don’t have to worry about over spraying or wasting your chemical solution with the Smith 190285. It features a comfortable, convenient shut-off to keep you in control of the hose and how much liquid it discharges. In the meantime, the unique gaskets and seals allow you to use caustic chemicals and bleach without damaging the pump. All you have to do with this unit is filling it up and start spraying without worrying about clogging. It comes with the patented SureSpray anti clog filter to assure you of steady spray. Essentially, this means that you can complete your tasks quicker. A sprayer’s pressure handle is essential as it determines the physical effort you’ll have to put in when pumping. 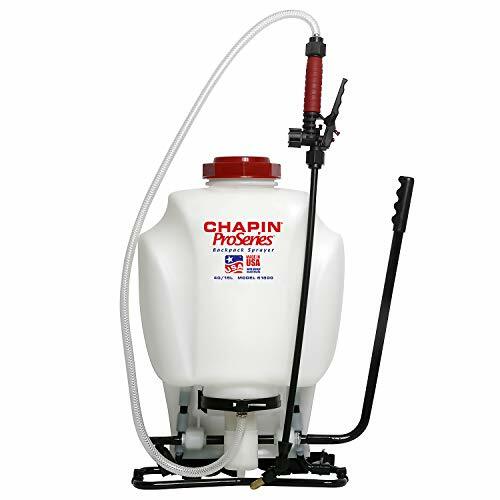 The Chapin 20000’s features a handle that will allow you to work efficiently and in comfort. 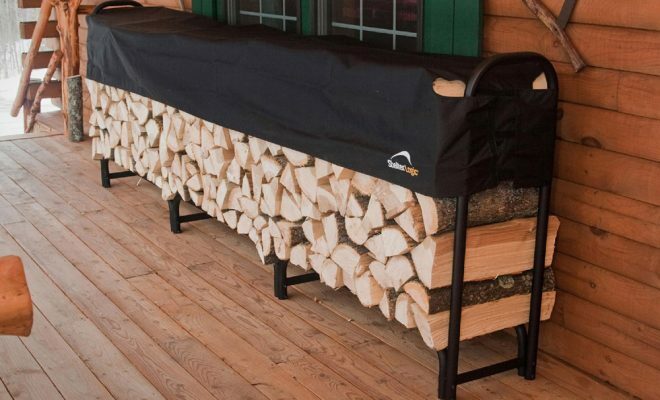 Furthermore, it weighs less than five pounds so you can bet that it’s easy to carry around the yard thereby enabling you to get more work done.